Christian Eriksen has called on Tottenham to repeat the performance in their impressive victory over Stoke when Brighton visit Wembley on Wednesday night. 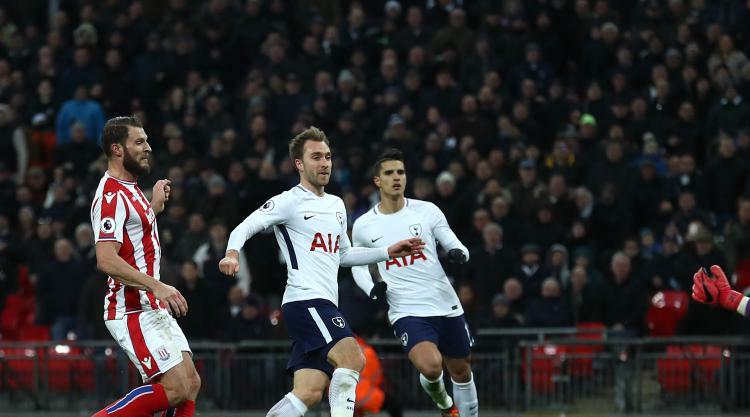 Having endured a four-match winless run in the Premier League, Spurs got back to their best as a scintillating second-half display helped them to a 5-1 win over the Potters. Only a Ryan Shawcross own goal separated the sides at the interval but man of the match Son Heung-min doubled the lead before Harry Kane scored a brace and Eriksen added the fifth. Shawcross headed in a consolation for the visitors but Tottenham had long-since wrapped up a vital three points, with Eriksen now wanting a similar showing when they host Brighton in midweek. "Our possession was a bit better against Stoke than it has been lately," he told the club's official website. "When you score goals it makes it easier and more fluent and we now have to do the same things on Wednesday. "It will be tough again, Brighton will probably look for a point - we want all three." While Kane's second effort saw him reach 50 for the club and country in the calendar year, he was outshone by Son as the South Korea international terrorised the Stoke back three. The 25-year-old has been in decent form of late but was full of praise for his team-mates for helping him to deliver. "I always try to give options on the left," he said. "The movement from Harry and Dele (Alli) make it easier because I can go one against one, sometimes cross, sometimes shoot. "We showed at 2-0 that we had the confidence to play, everyone wanted the ball, everyone wanted to score. We had even more chances. We're really happy to get these three points." Despite shipping five goals, Stoke goalkeeper Jack Butland was superb, keeping out Son, Kane and substitute Erik Lamela with great stops. But the England international knows improvement is needed throughout the team if they are to avoid being pulled further into the battle for top-flight survival. "Now you find out what kind of characters we've got," he told the Stoke Sentinel. "We need to show fight not just (in our next game at Burnley) on Tuesday but for the rest of the season. "If we continue to show performances like that against anyone we are going to struggle. It's all well and good having talent and ability in the squad but we've got to make sure are working hard and competing at the levels we need to compete. Today we weren't."